We’ve talked about the Oskar Blues Brewery a number of times here at Aleheads. It’s a particular favorite of mine both for their extremely high-quality offerings and their whimsical take on craft brewing. The most notable feature of all of Oskar Blues beers is their packaging. It was the first microbrewery in the country to package and sell their beers in cans. Oskar Blues was founded by an Alabama native named Dale Katechis in the lovely hamlet of Lyons, Colorado. The brewery was opened in 1997, followed by a brewpub in 1999. Dale started canning his beers a few years later. The first beer he canned was his bold, hoppy pale ale (Dale’s Pale Ale). Why cans instead of bottles? At first, he did it just because it amused him. Drinking such a wonderfully potent craft brew out of the most plebeian of beer delivery vehicles was richly contradictory. The gimmick also made Oskar Blues a darling of the craft beer world and helped put the small, Colorado brewery on the map. Contrary to popular belief, aluminum cans do NOT distort the flavor of beer. Modern cans are lined with a water-based coating that prevents the beer from ever making contact with the metal. The beer that pours out of a can will taste exactly the same as it did when it went into the can. Cans are actually BETTER for a beer’s shelf-life than bottles. Because cans are sealed tighter than bottles and are impervious to light, canned beer won’t spoil as quickly as those in bottles (particularly those sold in clear bottles like Newcastle). The canning process Oskar Blues uses creates very low levels of dissolved oxygen which is one of the contributing factors to beer spoilage. As such, the brewery’s beers stay perfectly fresh for a particularly long time. Cans are much easier to recycle and ship than bottles so they are cheaper and more environmentally friendly. It’s just plain fun pounding a great beer out of a can. But how does it taste? 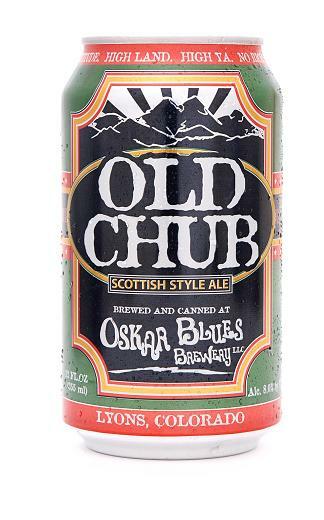 I cracked open Oskar Blue’s renowned Scotch Ale, the Old Chub, to find out. The beer poured a very dark mahogany with some pretty, red highlights. Wifey McHops noted that it resembled Dr. Pepper and I couldn’t really argue. The head was full, off-white, and lingered for quite awhile. I was surprised at how light-colored the head was compared to the beer. Wifey declared that it was the color of the pureed lentils that we had just made for Baby McHops. Her color-analogy skills are clearly beyond reproach. The nose had a huge malt profile. The only bitterness was from a slight alcohol tinge…the Old Chub has very little hops present. Some yeast notes were detected and there was a background smell of mustiness and mung (the goo stuck on the basement floor of a fraternity after a particularly rowdy night). Wifey pointed out that the smell was excellent, but it triggered mucus production in the back of her throat. Sure. OK. The taste was as malty as the nose implied, but for such a huge, robust flavor, it was an incredibly smooth beer. There’s a slight alcohol aftertaste which lingers and some prevalent flavors of smoked wood, peat, and Scotch. The Old Chub is extraordinarily well-balanced for a strong, Scotch Ale (8%) and it has a slick, not thick, mouthfeel (good “mouthlegs” as the wife would say). I found the Old Chub to be highly drinkable for such a strong brew. The maltiness is certainly the dominant flavor, but there is so much more to the beer than that. It’s extremely easy to drink for the style and it looks and tastes exactly like a Scotch Ale should. The Old Chub also gets major bonus points for being in a can. After draining my glass, I drank another straight from the can and it was just as delicious. I loved the cognitive dissonance of drinking such a bold, robust brew out of the most humble of beer containers. 3.5 Hops from Brother Barley for this beautiful offering from Oskar Blues. Posted in Tasting Notes.Tagged Cans, Old Chub, Oskar Blues, Scotch Ale. When I used to think of “Good” beer from a can, I always thought of the many English and Irish ales on the market (Boddingtons, Tetleys, and of course Guinness/Murphy’s/Beamish). The first craft beer I ever came across in cans was the Brooklyn Lager, and I honestly wasn’t all that impressed (I admit, not my favorite beer in draught or bottle either). Then I came across Newcastle Brown Ale and was hoping that the can would overcome the skunky taste from what I thought was caused by their normal clear bottles – Nope. Alas, Oskar Blues changed my perceptions on canned beer and confirm everything that Brother Barley preaches. Granted, everything that Oskar makes would presumably still be great in the bottle, but I like to think that the cans add a little something to their brews. There’s a few New England breweries that are putting their lagers and pale ales in cans, but Oskar Blues has to be the only company bold enough to put Scotch Ales and Imperial Stouts into an aluminum jacket. Cheers to them, and cheers to the can!